From the magic of Disneyland to the chill vibes of Huntington Beach, Orange County is home to a lot of popular tourist destinations. But what people who are new to the area wouldn’t know is that Orange County is also full of a lot of other hidden gems. Check out these five secrets about living in Orange County that only locals would know! Orange County is known as the infamous backdrop to popular shows like Laguna Beach, The Hills, and The O.C. These shows often depict beautiful stars having the time of their lives as they cruise along the traffic-free coast in their Mercedes or frolic down the empty beaches in Newport. While these portrayals may have some truth behind them, others are pure exaggerations for the sake of entertainment. In reality, some of these shows weren’t even filmed in Orange County. So no, locals don’t actually call Orange County “The O.C.” and not everyone drives a Mercedes, but there are so many reasons why the reality of Orange County is even better than how it appears on television. Good food? Check. Awesome people? You bet. Fun adventures? Of course. Orange County really does have it all and television shows just don’t do this extraordinary place justice. …but there are ways to get around it! If you’ve ever been to Orange County, you’ve probably heard people referring to the 5, the 22, the 55, and the 405. These seemingly random numbers are actually names of freeways and talking about the best way to navigate the roads is like another language to Orange County residents. Orange County natives have mastered the art of the sometimes hectic freeways and you can too by following these tips. First, avoid rush hour. Although it varies depending on the freeway and your direction of travel, the weekday morning commute is generally from 7:30am to 9am, while the after-work commute typically lasts from 4pm to 6:30pm. Fridays, however, are a whole different story with the after-work commute starting as early as 1pm. If you’re traveling on the weekend, it’s best to start early or after dinner to avoid the potential traffic from people heading off to their next adventure. Another helpful tip is to download Google Maps or Waze. Unlike some other GPS systems, these apps offer alternative routes and route changes to help you get to your destination as quickly as possible. Since Orange County has so many exciting things to do and something for everyone in each city, the freeways can get a bit crazy, but the priceless memories you’ll make from your day trip to the beach or the many laughs you’ll have during your amusement park adventure will make the commute more than worth it! …or any weekday really. 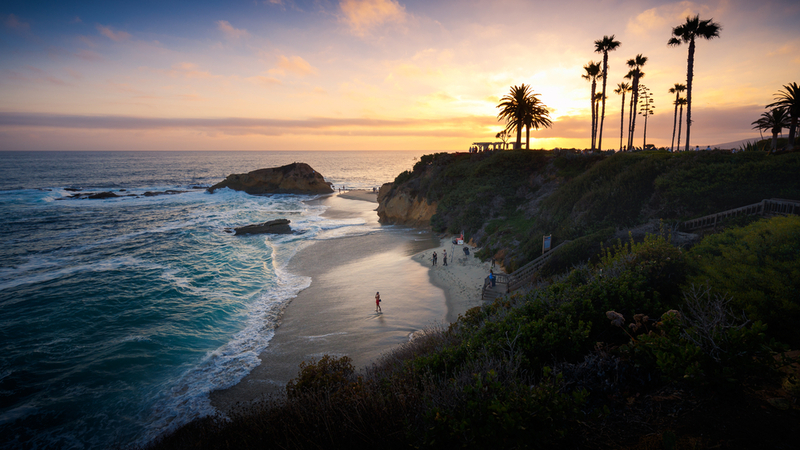 It’s no secret that Orange County is home to some of the best beaches along the West Coast. There’s the infamous Newport Beach, tourist favorite Laguna Beach, and the holy grail of surfing, Huntington Beach, just to name a few! But with the wildly popular beaches comes the huge crowds and parking nightmare. So when’s the best time to go to your favorite beach without all the hassle? Well, from our experience living in Orange County, we found that the middle of the week is the best time to escape the crowds that tend to populate every Saturday and Sunday. If you are going on a weekend, however, try to beat the rush and head to the beach in the early morning. Nothing sounds better than a peaceful morning relaxing on the beach followed by a delicious brunch along the water. Another beach tip is to avoid the peak of summer if possible. Autumn is an ideal time to visit the beach and it’s Southern California so the weather is always perfect regardless of the time of year! From the octopus ceviche at Javier’s in Newport Beach to the soup dumplings at Din Tai Fung in Costa Mesa, Orange County hosts a wide variety of cuisine. Every city has their specialties, so almost every type of food is accessible as long as you know where to go. Want to find the best food without taking all the time and effort to do the research? Check out some of our past blogs to find the best dessert spots , top brunch destinations, and more! 5. Orange County really is the best place to live! Orange County has more than just gorgeous beaches and yummy grub. The fantastic sights, relaxing vibes, and plethora of things to do are giving locals so much to love about their hometowns. Comprised of 34 cities with over three million residents, Orange County is much more diverse than television may lead people to believe. Looking for a quiet place where you can walk around the farmer’s’ market or browse antique stores? Old towne Orange is the perfect place for you. Maybe you want something with a bit more nightlife? Check out Fullerton and everything the city has to offer. In Orange County, there truly is something for everyone! Interested in moving to Orange County? Let us know and we’d be more than happy to help!